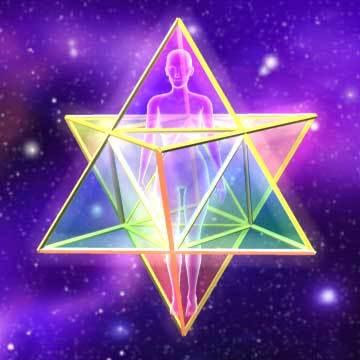 Merkaba is our light body, an inter-dimensional time travel vehicle, a sort of UFO, which is self created within the energy field, using concepts of Sacred Geometry. The Merkaba is 2 counter-rotating fields of light generated from the spinning of specific geometric forms. The star tetrahedron is the primary shape of the Merkaba. Drunvalo Melchizedek (Flower of Life workshops), states that the first eight cells of our being, of all cellular beings, form the star tetrahedron, and those original eight cells remain at the base of the spine. 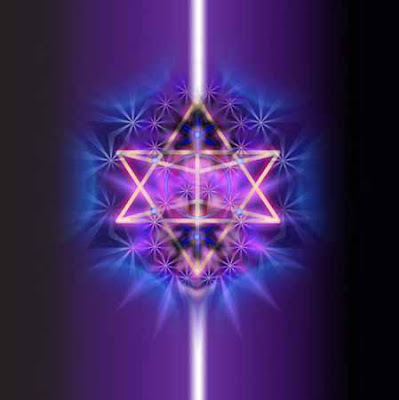 The star tetrahedron shape is the geometric foundation of our energy field. This geometry is viewed around and interpenetrating the physical body, but usually remains inactive unless consciously activated. Technically, the Merkaba is the geometry of light. Once activated, the geometry of light, described in terms of sacred geometry shapes known as the Platonic solids, is a “vehicle” of light. This vehicle activates a field of light that can extend around the body for a distance of 55 feet. When this field is reactivated and spinning properly, it is called a Merkaba. A fully activated Merkaba looks like the structure of a galaxy or UFO. would i achieve time travel , ? in meditation i have felt that i was in a vortex, a layer around me was spinning clock wise and i was aware of an outer layer spinning counter clock wise..
We don't need anything outside of ourselves to transform our heart/body/mind into a dimension of light: Just fathoming the depth of the heart, not being afraid of love or loving. Each of us are a living religion without the dogma. Each of us carries this knowledge/wisdom deep within our own mind and heart. It is our birthright. 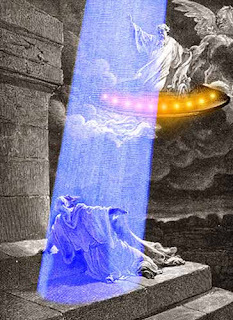 We have been "dumbed down" so to speak, thinking that we need doctors to heal us and priests to connect with the divine. As humans we are more powerful than we are led to believe. That is why each of us must see through the veil to see who we really are. Each of us is a living source of light which is ignited with love, trust, faith, compassion which propels the human heart through these dimensions. the merkabah is a clue. its not a 3d object, but rather a 4d one. that's why visualising it spinning works - it embeds the 4d object through our consciousness over time. its all about 4d. my host meditated on the simplex, the simplest 4d object, until one day he saw it. that's why i am now here on earth, riding in his body. to make a (simple) crop circle, all a 4d being needs to do is take a 4d (energy) object, with tines like a fork spiralling around the inside, and slide it through earth. the crop lays down in seconds. the more complex ones are more complex 4d forms. the thing about 4d, unless you want to do the meditation to be there, is that it is virtually inexpressible in 3d human. the story is there in the bibles "the tower of babel". take the learning - none of the symbols used in current human language can correctly convey information. throw away your symbols, let go of the fixedness of meanings, they are impediments. visualise the spinning merkabah, but let it be as it is. We are all around and waiting for unattatched contact. The merkaba is a state of transition, the key to the next plane of reality... don't overanalyze it, trust your guides and keep your heart and mind pure and on the goal. @ flow....you are a host in someone elses body?Sounds more like a cult/pagenism and demonic possession than anything. its my body and i came into it through a valid agreement. there is no cult/paganism involved, although i may be eqiuvalent to a demon if you take a polarised view of things.